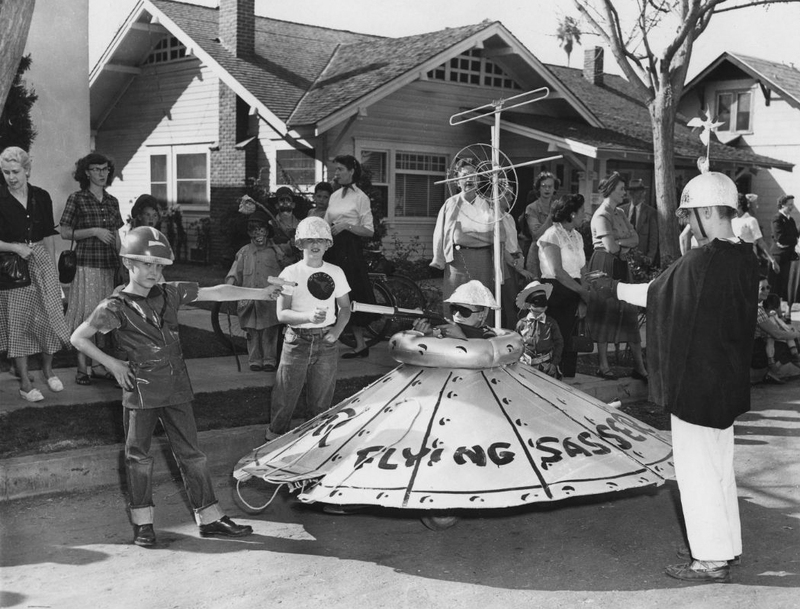 The Anaheim Hallowe'en Parade's theme in 1953 was "Out of This World" and featured, among many things, a witch riding a missile instead of a broom, a platoon of pretty young Martians wearing kitchen colanders on their heads, and, most memorable of all, a "Flying Sasser" built by neighborhood kids. Anaheim's Sasser-heritage. We owe it all to these kids. Thanks to the one-and-only known photograph taken of it, the "Sasser" managed to survive obscurity over the passing years. Four boys, wielding toy space pistols, pose in front of homes on a suburban street (presumably Broadway or Center Street). 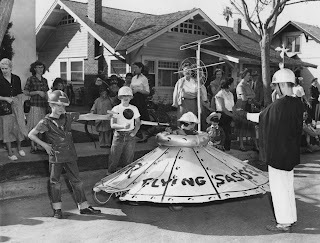 A TV antenna, borrowed temporarily from a rooftop, supplies a hint of a high-tech to the otherwise homemade-looking spacecraft. 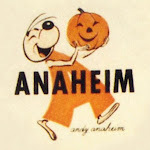 The scene is so charmingly Americana, it's no wonder the photo has been published in several books on Anaheim history. Even our local Ruby's Diner has a framed print on the wall over one of the tables. 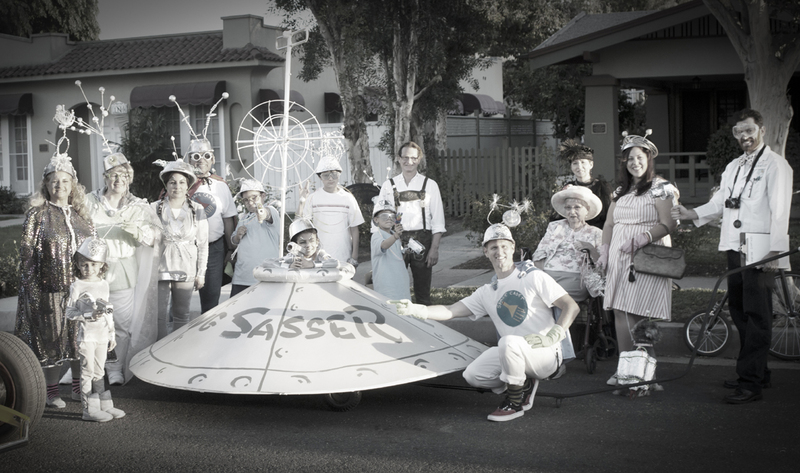 This year, on October 27, 2012, the Flying Sasser returned to the Anaheim Halloween Parade, 59 years after it first appeared, thanks to some creative people in the AHS. Anaheim resident and AHS member Bill Couture recreated the Sasser from scratch, and we think his might be even better than the original. Bill is one of the most generous and creative guys we know, volunteering his time and many talents to all of our events and endeavors, no matter how crazy. 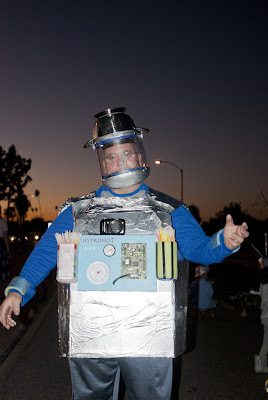 And, incidentally, he also made his kooky space suit, complete with glow sticks that he gave to kids in the audience. Bill, you are our hero. From out of Anaheim's Hallowe'en past, a cardboard-box robot returns! 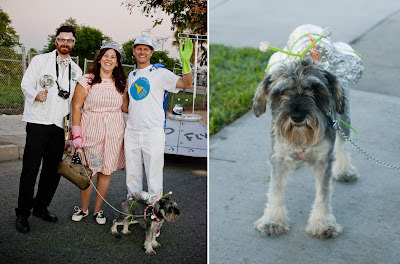 Jeremy, Natalie, Kevin, and Sophie the SpaceDog, sport tin foil accessories. 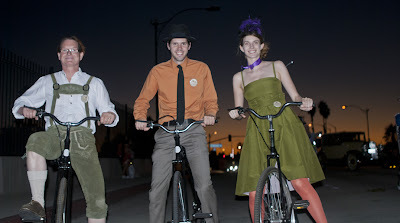 Greg, Jason, and Jessica on on their penny-farthing bikes. Plans for new surprises are already being made for next year’s Halloween Parade, and we hope you’ll volunteer to perform along with us in this favorite Anaheim community tradition!! With a matching grant of $6,000 from the Anaheim Historical Society, along with a similar grant of $1,932 from the Friends of the Anaheim Public Library, the City of Anaheim recently completed its first major interior restoration project at the 1896 Woelke-Stoffel House located in Founders’ Park. 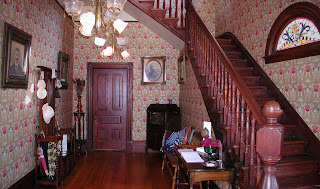 Fresh paint, refinished woodwork and period appropriate wallpaper have enhanced the entry hall, tower nook and formal stairway. Come see the spectacular results during the public Open Houses held on the first Saturday of every month, 9:00am to 12:00pm. Dinah and Larry Torgerson bought their “wreck” of a historic home in 1979. They became part of the “second wave” of leaders in the historic preservation movement in Anaheim. (Of course, the first wave was Diann Marsh and Andy Deneau.) 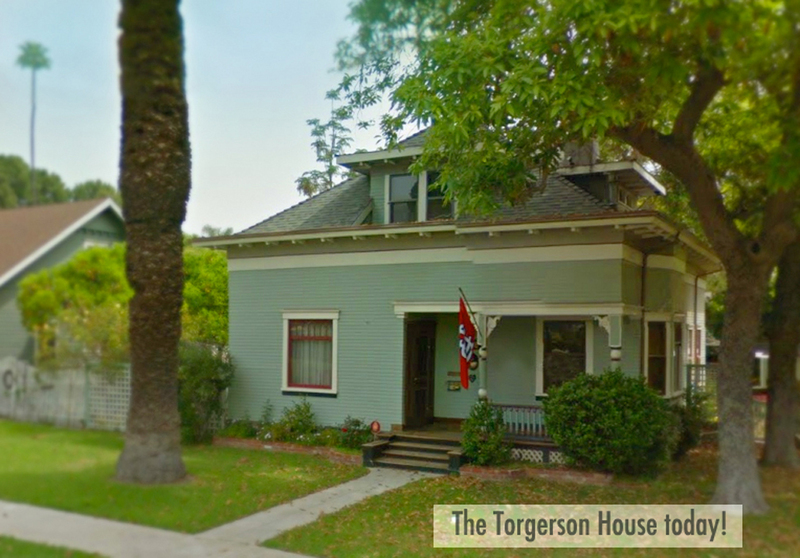 The Torgersens are still here today, and because of their vision, their house is still here as well. 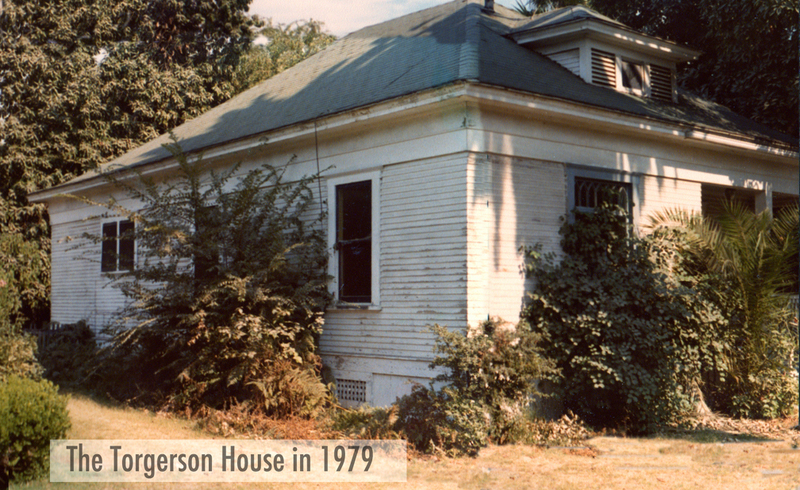 In 1978, 28-year-old Dinah was renting a modest 1920s house at 318 N. Claudina Street. Dinah was a clerk for the OC Social Services Agency and engaged to be married to Larry Torgerson, a 32-year-old button salesman who worked in the garment business in downtown LA. When Larry visited his fiancée, the couple would often walk to the few remaining businesses in downtown. During one walk in the neighborhood, they noticed a small run-down house at 216 N. Claudina Street that was for sale. It did have a stunning front door, with its dental detailing, applied carvings, and welcoming oval window. “It was the only redeeming feature of the house,” Dinah recalls. Though they had intended to buy a tract house in a nicer locale, the pair was curious enough to ask the realtor to see the 1906 two bedroom, one bath “fixer-upper.” It was so bad – from the crumbling brick and mortar foundation to the weathered roof – that Dinah said it probably should have been torn down. $47,000. Deneau and Marsh, as well as other friends whom the couple had come to know, strongly encouraged - perhaps some would say pressured - them to buy the house. They thought Dinah and Larry were just the kind of like-minded people who would be willing to fix up an old house and perhaps bring hope to saving the neighborhood. They were right. The Anaheim Redevelopment Agency offered them a low interest purchase plus rehab loan, but the catch was if Larry and Dinah applied as a married couple, they would be over the income requirements. The solution was to delay their wedding until Larry, by himself, could purchase the house for a total of $67,000. The day after escrow closed, Larry and Dinah became Mr. and Mrs. Torgerson, and their adventure began. They did not move into the house immediately; after all, it was hardly livable. While the Torgersons lived in Dinah’s rental, a contractor began work, starting with a new foundation. A new roof was installed; electric and plumbing systems were replaced. The clapboard siding was sandblasted to remove the peeling paint, something they would later regret. Dinah said, “We weren’t old house people – We didn’t know any better.” Larry eventually replaced the pitted and scarred clapboard. They moved into their house in late 1979, three months after purchase. They tackled other projects by themselves. After working all day at their jobs, they would come home most evenings and toil away on the house. 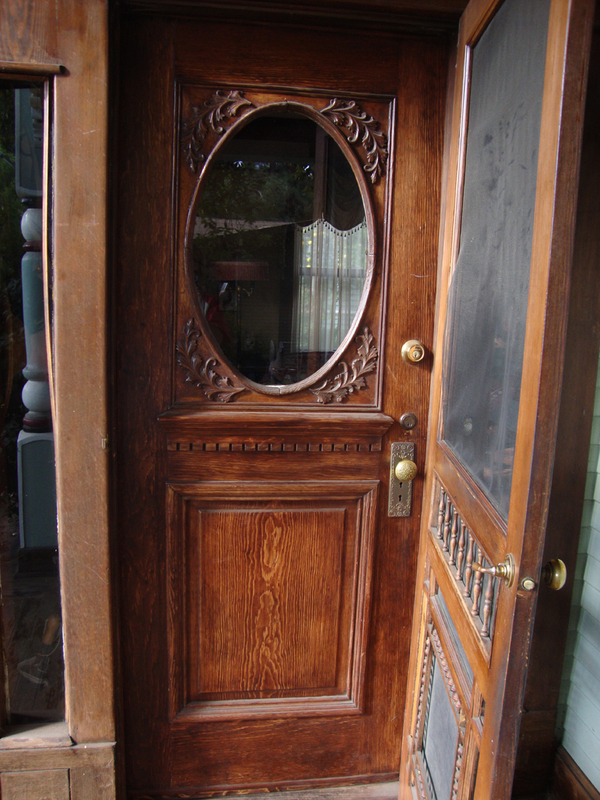 They started with their beloved front door. It was dipped and stripped, removing the gold and green faux antique finish, taking it down to the beautiful natural Douglas fir. 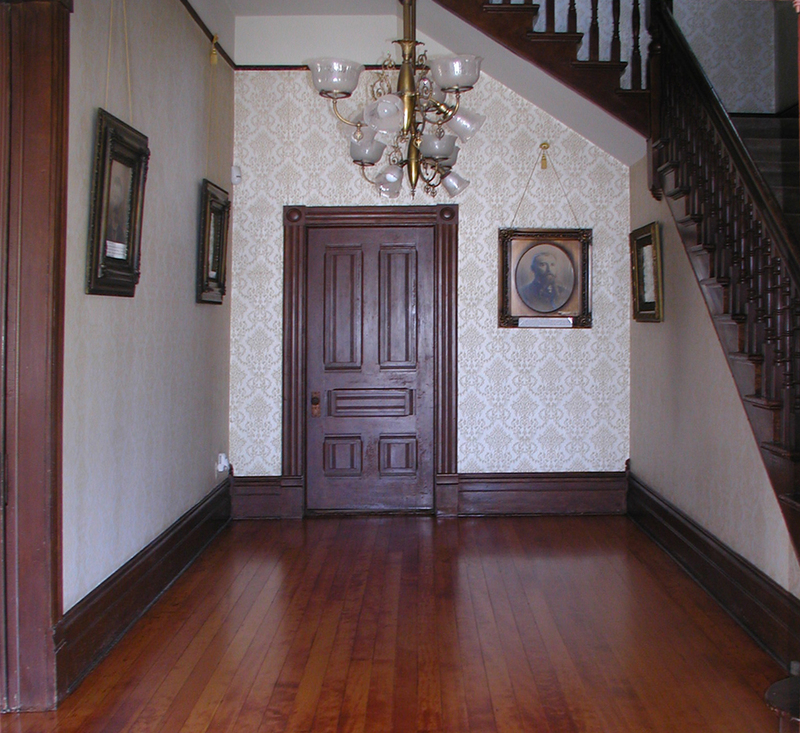 With help from friends and family, they tore all the walls back to the original walls and refurbished the hardwood floors. A deck was built in the back and new landscaping was installed. They just threw the entire old kitchen out the back door in a heap and started over. Larry gained so much technical knowledge by working on his home over the years that he is now considered one of the finest woodworkers in the Colony. The couple would also make late night raids into downtown Anaheim, where demolitions were ongoing. There, dressed in dark clothing, they would help themselves to old bricks, cabinets, doors, and plaster pediments, which they would use for fixing up their house – but that wasn’t all. With a family that grew to include two children, the Torgersons added 800 square feet upstairs, with two bedrooms and a bathroom, increasing the size of the house to 1,800 square feet at a total cost of about $30,000. When the Torgersons bought their home, they were young, energetic, and naïve. 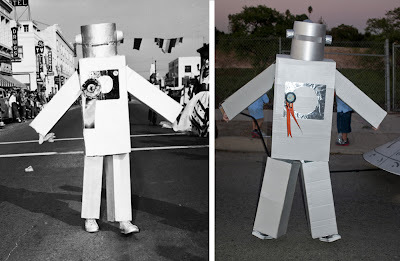 But with that old house, they made more friends in the neighborhood, got involved with the neighborhood council, joined the Anaheim Historical Society, and later became co-founders of the Anaheim Neighborhood Association. Buying that house and sensing the clear need to do something about their neighborhood changed their lives, as it did with the entire second wave of emerging activists and leaders in the historic preservation movement. The Torgersons have seen many positive changes made in the neighborhood over time, and they live and participate in the community to this day, 33 years later. Once upon a time, short-sighted developers leveled Anaheim’s historic downtown and, for many years after, it seemed as if our city’s spark of life had gone away with its old buildings. Today, at last, after a decades-long slumber, Downtown is waking up as new boutiques and dining spots are opening their doors along the north side of Center Street. Starting at the west end of the street (across from the ice skating rink), our newest neighborhood hangout, Gypsy Den brings a bohemian vibe to the tree-shaded corner. 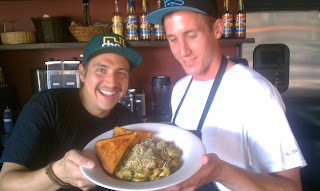 Serving breakfast, lunch and dinner, excellent coffee, local beer and wine, the restaurant is already a north OC favorite. We're not the only ones who think so; Anaheim's Gypsy Den was recently named "Best Coffee House in Orange County" by the OC Register. 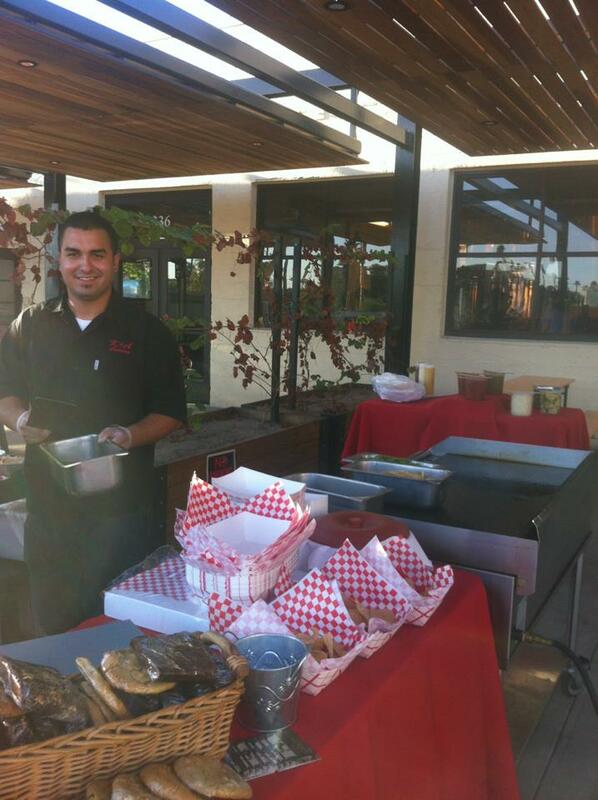 Cervantes also cooks up fresh tacos, nachos and quesadillas at the Anaheim Brewery's beer garden every Tuesday evening from 5 to 8:30. One counter over, Healthy Junk transforms all your favorite comfort foods into better-for-you options. 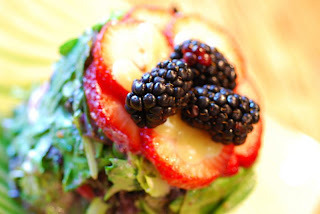 Be sure to say hello to Chef Lynda Santos who is just about the friendliest person you’ll ever meet. There’s more healthy eating down the street at 118 Degrees, offering vegetarian breakfast, lunch, and dinner, prepared by hand using local organic produce. Try the fresh young coconut for a cooling beverage that is a pure delight. After you’ve filled up on all this good food, explore the new shops, HOME ECO:NOMICS, The GOOD, and HEART & SOLE, for eclectic offerings, many made by local craftspeople. BARBEER is a unique old-fashioned barbershop specializing in classic cuts for men—and soon they'll serve beer, too! There’s much more coming to Center Street in the months ahead, and of course, the greatest anticipation of all: the opening of the restored 1919 Packing House as a culinary center and public marketplace. 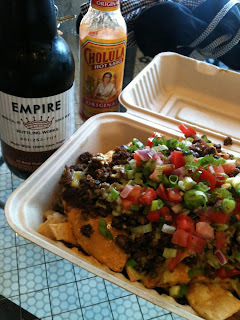 More delights are on the way. Tell your friends, coworkers, and family about the New Downtown Anaheim and, if you haven’t already, go check out all that it has to offer right away. 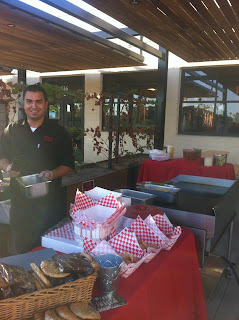 Please support the new businesses that have bravely made the leap and invested their passion and dollars into Anaheim. 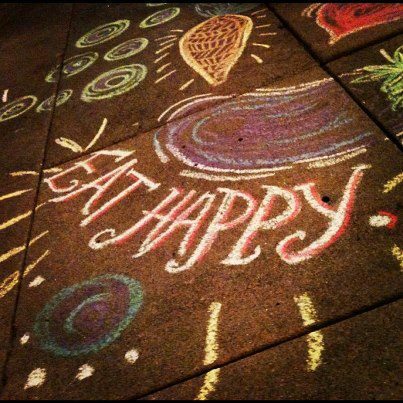 Let’s turn our hopes for a beautiful, vibrant downtown into a reality.